There is something wonderful about creating an object that is functional, and it is particularly wonderful to create one that serves a function as fundamental as eating. To be able to do that using just the strength and skill of your hands is very precious. 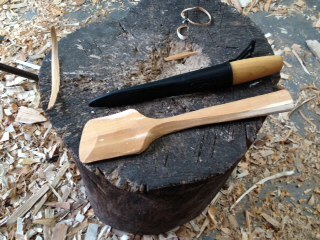 For a number of years, I had dabbled in whittling and spoon carving, and could already hack out a reasonably spoon-shaped object but, becoming increasingly frustrated by my inability to make more progress, I needed further guidance. It was time to choose a course. 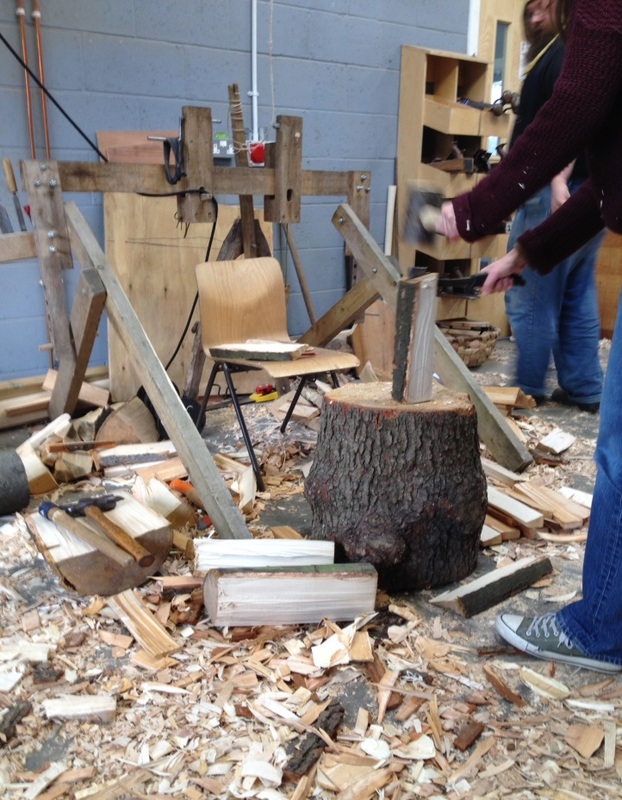 If you own a wood, or have access to woodland materials, it is important to do justice to those materials however you choose to use them, so I wanted to learn from a master craftsman. A search of the internet revealed that Barnaby Carder was delivering courses within easy travelling distance. I had heard of Barn the Spoon's reputation: having roamed the woods for many years carving spoons - he had now set up a shop in Hackney, demonstrating in a very tangible way the value of the handmade in a modern urban environment. 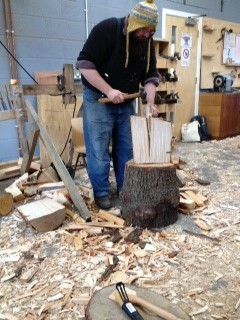 He was also running courses from Stepney City Farm which would teach me the axe and knife skills I required. A bustling Farmers' Market was in full swing when I arrived for the ten o'clock start. It was good to see how the countryside was being brought into the city, and visitors could watch the 'country' crafts course though the glass doors of the warm and cosy workshop. Once Barn had introduced himself to the eight participants and given a short safety briefing , we were straight into knife work using pre-prepared spoon blanks of orange and cream alder. 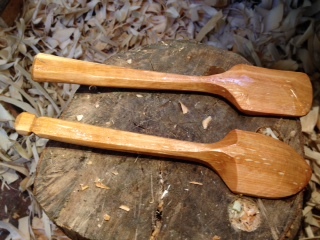 The first project was carving spatulas. Each knife hold was explained and demonstrated clearly and patiently and, after enough time had elapsed for us to achieve the desired effect with that hold, a new one was demonstrated. Much thought had been given to the order in which each skill was introduced - powerful holds removing large quantities of wood to rough out the shape were followed by more controlled holds to facilitate delicate carving. More than one hold to achieve the same effect was taught so that individual preferences could be catered for. During each demonstration Barn explained clearly why, as well as how, a particular knife stroke worked. We spent the morning creating our spatulas. The emphasis was on learning skills. This was very pleasing as learning the process is more important than creating the product. If you can learn the skills, the product will take care of itself, and your own style can develop freely. The importance of a razor sharp blade also became clear (and possibly the need for another course learning sharpening skills!) as the wood cut cleanly and easily with the well-honed Mora knives - for sale at the end of the day. Some of the holds looked scarily dangerous, particularly those where the knife was cutting towards the chest, but Barn demonstrated how to do them safely so that it was unlikely that a slip would occur, or cause serious injury if it did. An assistant was kept busy plying us with biscuits and tea (stirred with one of Barn's hand carved wooden eating spoons) but we were still ready to break for lunch and a chat half way through the course. It was interesting to share stories with the other participants, most of whom were complete novices. Barn emphasised the necessity of taking breaks from carving, as using a knife or an axe is hard on the hands, back and shoulders. He taught a variety or stretching and strengthening exercises to help avoid problems, and would stop the work regularly to remind us to do them. The afternoon was spent carving our first spoon. A slice of tree trunk was split into radial sections, creating thirty or so spoon blanks. We were shown how to use an axe, a mallet and a wooden wedge to split the log, and we each had a chance to have a go ourselves. Barn’s aim appeared to be to teach the use of as few tools as possible: the fewer the tools, the easier it is to carve spoons in the woods. Once the spoon blank was made we worked at our individual chopping blocks to rough out the bowl and handle, again using the axe. The workshop was arranged so that each student had their own chopping block made from a single log about 30/40 cm in diameter, approximately the height of a chair seat, and all carving was done whilst seated. A small indentation had been cut into the surface and used to support the bowl or handle of the spoon whilst carving to prevent it sliding off the block. There was a variety of axes to choose from. The cheaper Balco axe was good for removing large amounts of wood, but I preferred the more expensive Gansfors Bruks Hatchet, finding its smaller size and lighter weight easier to work with. For most of the afternoon we revisited the skills taught during the morning. Meditative silence was punctuated with brief flurries of campfire chatter - despite the absence of an open flame. Once the spoon was well shaped, curved spoon knives were used to carve out the bowl. Barn demonstrated a technique whereby the spoon knife was held in the fist and pushed from the near side of the spoon across to the far side whilst holding the bowl in the indentation on the top of the block. This was a remarkably controlled and incredibly safe method of using the tool. A couple of years ago I managed to stick the pointed end of a Mora hook knife through the skin of my wrist - I wish I had learned this method earlier! A day is a very short time to master everything that needs to be learned. Barn gave us some teaching about tool sharpening, although that was not the main focus of the course. However, his demonstration and explanation made clear what we were trying to achieve when sharpening tools: understanding the 'why' as well as the 'how' is important. Not only is Barn a master craftsman, he is also an outstanding teacher, generous with his hard-won skills and knowledge, and I feel privileged to have had the chance to learn from him. The course felt very casual, but was in fact as carefully crafted as one of his spoons. Safety was paramount, taught in such a way that it engendered confidence rather than fear. Each skill was consolidated before a new one was introduced, and Barn was aware of each participant's needs, usually anticipating and assisting before being asked for help. By the end of the day the humble spoon had become an object of respect and reverence. None of us left with a fully completed spoon or spatula, but all of us left with the skills, tools and enthusiasm to finish them off at home. 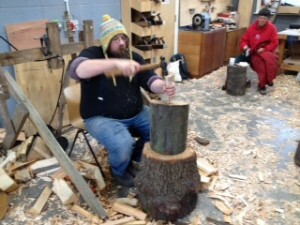 So next time you're out in the woods, whittling away, consider honing your skills with a well taught course: it's useful, it's sociable and - best of all - it's great fun. 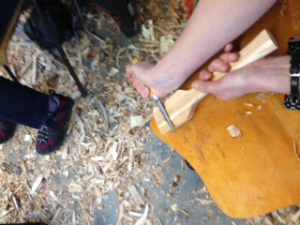 Thank you for this well-written and inspiring account of being on this spoon-carving course! It’s detailed enough to be a clear recommendation of what one might hope for from the course, and also describes the length of time it may take to aquire a skill. It’s lovely to read your appreciation of the tutor and takes me a step nearer to applying to do the course myself one day. p.s. Have you thought of submitting it to Country Living Magazine who do a regular article on ‘Country in the City’, for publication?